How getting too busy after a significant death in the family can prevent proper grief. How to finally make a painfully difficult business decision. How walking through fear can be one of the most important things you need to do. How it can be time to move on from a business you absolutely love. Why it’s common to lose touch with your authentic self in midlife. How clues from your past can help you find what’s missing in your life now. How doing scary things can be exactly what you need to evolve into the next best version of yourself, professionally and personally. This week’s episode features an interview that’s part of the Getting Real with Women in the Middle mini series. Getting Real introduces you to real life women in the middle who have made a big change and figured out how to love their midlife. 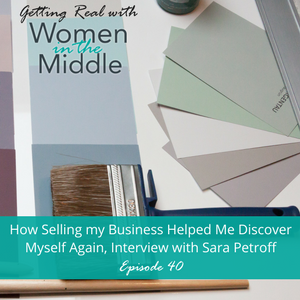 Join us as we meet Sara Petroff, a creative entrepreneur who made an incredibly difficult decision to sell a successful art gallery business after 20 years. It was a hard road back, but she eventually rediscovered herself and her core gifts and talents as an interior designer. The transition in her career from a direction she knew to a direction she didn’t know became pretty debilitating. It was surprisingly difficult for Sara to see her way to the other side. She had completely lost touch with who she really was at her core. 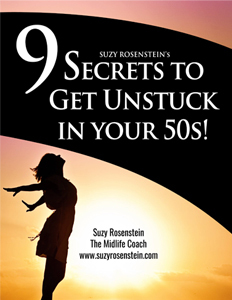 During her midlife funk, Sara had absolutely no awareness of her gifts and the way she was meant to contribute. But, the combination of honest introspection, supportive friends, family, kindness and therapy became the pillars of support that helped propel her through to the next amazing phase of her life. Moving through fear helped her change the lens that she saw her life through; her courage eventually opened the door to possibility and opportunity that she couldn’t even imagine. She now enjoys a completely different and successful, creative entrepreneurial direction as a highly regarded designer and loves her new life.